While walking fields of Iowa corn in July, I was proud to see the difference between our Intent to Pivot trials and adjacent rows that grew without having the benefit of Pivot Bio’s nitrogen-producing microbes. The visual difference was startling. 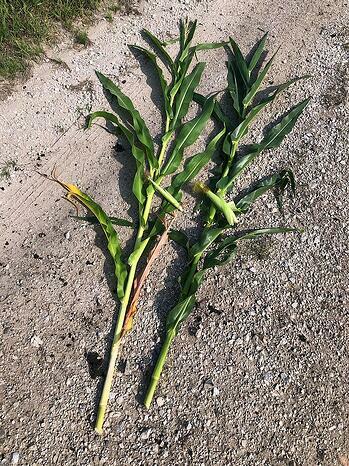 Corn grown with Pivot Bio’s nitrogen-producing microbes (right) is greener and healthier. The plant is able to develop a bigger ear of corn by having just enough nitrogen available at the proper time. The rows planted with Pivot Bio’s nitrogen-producing microbes were healthier and greener. Without our microbes, the lower leaves on the plants were yellow, a sign of nitrogen deficiency. Pivot Bio’s microbes were providing nitrogen at just the right time, enabling better development of each ear of corn. 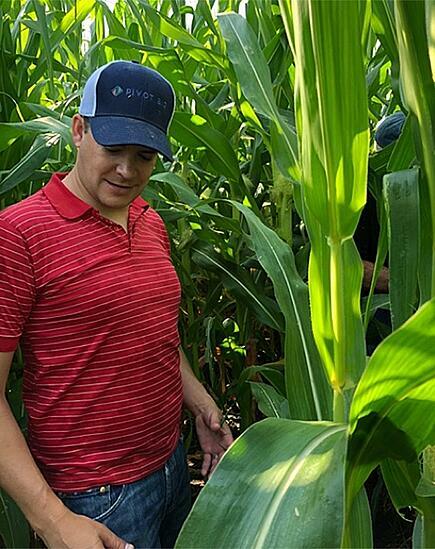 In fact, plants fueled by Pivot Bio’s nitrogen-producing microbes were producing much bigger ears of corn than their neighbors across the row. And we didn’t just see it in one row, it was across the plot. And it’s been observed in other plots, in different growing conditions, in different soils, and across corn varieties as part of our national Intent to Pivot program. It’s not just one plant. We’re seeing row upon row of healthier corn when grown with Pivot Bio’s nitrogen-producing microbes (right). Seeing is believing… whether it’s confirming dark and healthy green stalks, carefully looking for signs of stress, or measuring nitrogen deficiency. The Pivot Bio team has also been digging up roots to send to the lab. There, we digitize and map the symbiosis between our microbes and the plant’s root system. This data reveals the precise molecular details of nitrogen produced by our microbes and supplied to the plant. What an amazing opportunity to walk through the fields side-by-side with the growers testing our first product. I was in my element. Carefully side-stepping through tightly planted rows and assessing the corn plants was like admiring my own children’s growth. I can’t wait to get back in the field for harvest to quantify the full benefit of nitrogen produced on-demand throughout the plant’s lifecycle. I am thrilled with the results so far, and I look forward to an exclusive commercial launch in 2019 to help US corn growers produce a more profitable, sustainable crop.